Wooden combs aren’t exactly new, but they’re a little-known beauty secret. With fancy plastics and metals dominating the comb and hairbrush world, it’s easy for wooden combs to fall under the radar. But using a wooden comb actually can benefit the hair and scalp. Wooden combs are easier on the scalp. Fans of them say that they feel like a scalp massage when you’re using them. It’s a lot less stressful than the pokes and pulls of plastic or metal combs and brushes. This can also mean a possible reduction in dandruff, since the scalp isn’t as abused. Wooden combs are known for reducing static, since wood isn’t a natural conductor of electricity. They’re gentler on the hair itself. They’re a sturdy option that doesn’t seem to break the hair as much, and the slicked wood glides through the hair well. Fans of wooden combs report their hair has more body and bounce. Wooden combs can catch and distribute the natural oils in the hair better, leading to more healthy, moisturized ends. Plus, that can make the scalp less greasy. 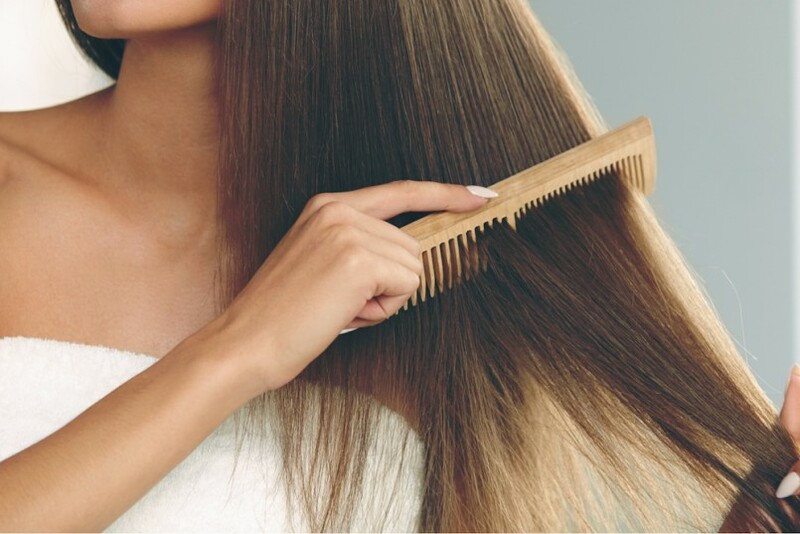 If you use a blow dryer while you comb your hair, wooden combs can stay cooler since wood does not conduct heat. Convinced yet? But keep in mind, wooden combs have some special considerations. Wooden combs have different needs than a regular comb. When you clean them, use a natural oil like jojoba, olive, coconut or camellia. That will create less stress on the wood than normal soap and water. Use a cloth to get in between the teeth of the comb, which will get rid of any gunk and fuzz. If you have a lot of gunk in the comb, you can also use a soft-bristled makeup brush to clean it. Another care option also includes waxing the wood down so the comb pulls on hair less. Make sure to use a safe, organic wax if you choose this method. Sometimes a wooden comb may come with some wax, too. Rather than just running to any store and getting a random wooden comb, there are superior types to look into. You’ll want a wide-toothed comb, since those will put the least amount of stress on the hair. They’re also suitable for all hair types. An example is this comb here. There are even combs out there that are highly scented after the wood they are made from, like this 100 percent sandalwood comb.